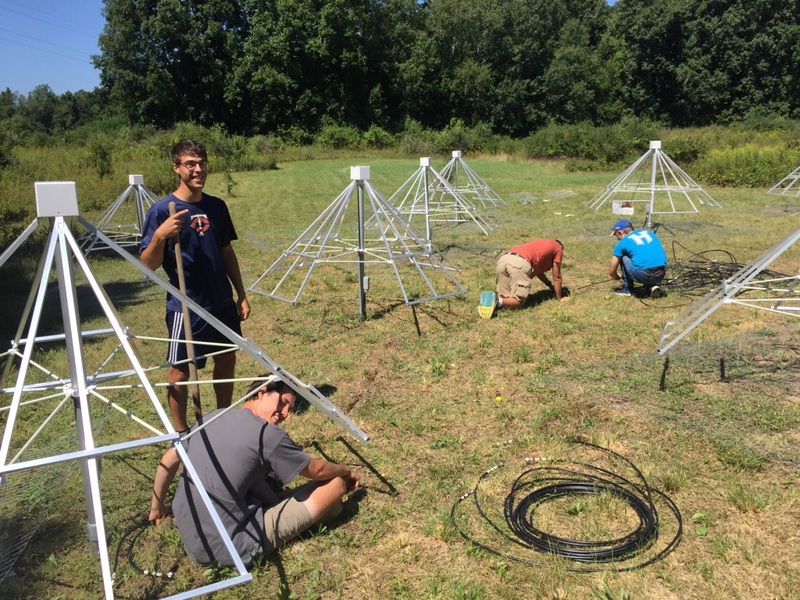 Five Hillsdale College stu­dents spent five weeks at the end of their summer digging trenches in Hayden Park, sol­dering cables, pro­gramming software, and ana­lyzing data for a special radio astronomy project. Under the super­vision of Assistant Pro­fessor of Physics Timothy Dolch, the group con­structed a radio tele­scope antenna array, called the Low-Fre­quency All-Sky Monitor, that will be used by the physics department as a lab. The new station joins four others across the country that com­mu­nicate with each other, forming a col­lab­o­rative tele­scope that detects and reads natural radio emis­sions coming from the sky. These signals show sudden, short astro­physical changes such as pulses from neutron stars in our own galaxy and pos­sibly others. The benefit of a system such as this is the ability to observe the sky through radio waves at any time of the day or in any weather con­dition. Celestial bodies, such as the sun and Jupiter, appear very bright to the monitor due to the radio waves they emit through solar bursts and radio storms, Dolch explained. While the causes of some radio flashes are known, that is not always the case. Senior Jay Rose is one of the five stu­dents working at the site. He has been using pro­gramming and elec­trical engi­neering skills at the site by working with the pro­gramming lan­guage Simulink, a MATLAB software, as well as the telescope’s Field-Pro­gram­mable Gate Array, which processes incoming signals. Earlier in the summer, Rose spent eight weeks in China working with the National Astro­nomical Obser­vatory of China (NAOC), where he had an internship at the Five-hundred-meter Aperture Spherical Tele­scope (FAST) in Pingtang, China, the largest radio tele­scope in the world. The other stu­dents include sopho­mores Philip Andrews, Nathaniel Birzer, Sashabaw Nied­balski, and Caleb Ramette, who worked on con­struction and tech­nical duties. Ramette explained that the group used a spectrum ana­lyzer to identify radio inter­ference, deter­mining the quality of the data. Dolch said that the array often picks up CB radio, FM sta­tions, and activity at nearby houses. If a potential astro­physical signal is detected, the telescope’s com­puters will then send out alerts to the col­lab­o­rating sta­tions in West Vir­ginia, Texas, New Mexico, and Cal­i­fornia. 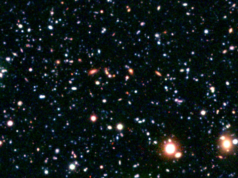 If the other sta­tions notice the same activity, chances are the signals actually indicate some legit­imate astro­physical change instead of RFI. 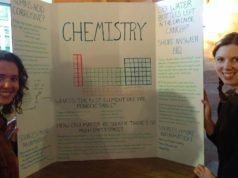 The site allows stu­dents to explore the increased interest in com­puter science and engi­neering at Hillsdale. During the con­struction of the site, stu­dents essen­tially prac­ticed elec­trical engi­neering tech­niques. 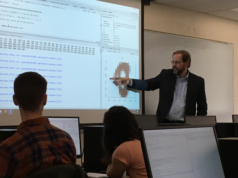 “Now that we have the per­manent site in place, it opens so many doors for our­selves and future stu­dents to use the instrument to study cutting edge physics like Fast Radio Bursts (FRBs), and I think that is pretty attractive to stu­dents inter­ested in physics who are con­sid­ering attending the college,” Andrews said. Dolch said that while this type of station has never been located in a climate as cold as Hillsdale, the con­struction of the array allows it to work in all seasons, given proper main­te­nance. “There were more than a few road­blocks along the way, and they were cer­tainly frus­trating to come up with and enact solu­tions for, but my fellow researchers and I, with Dr. Dolch’s guidance, were always able to work together as a team, which was the best part of the research,” Birzer said. Andrews said he par­tic­u­larly enjoyed when the team rented a Ditch Witch machine, which allowed them to avoid man­ually digging more than 700 feet of trench to bury the array’s cables, allowing them to effi­ciently hide the wiring from animals that might oth­erwise chew them. Dolch said that the station will not only be an edu­ca­tional resource for stu­dents in the physics department and his col­leagues, but that other stu­dents also will have the oppor­tunity to learn from the display. “This is a chance for a small department from a school most people don’t think of as having as strong of sci­ences as it does to put its name in with research uni­ver­sities many times Hillsdale’s size, in a fast expanding area in physics,” Andrews said.